Made with a healthy mixture of Chicken, Turkey and White fish with vitamins and Minerals. This delectable treat is perfect for adult cats and growing kittens. Ideal as an accompaniment to dry food, to feed alone, or as a treat. Nutritionally complete and balanced. Formulated to meet the nutritional levels established by the AAFCO Cat Food Nutrient Profiles for all life stages. Chicken, Chicken Broth, Turkey, Ocean White Fish, Chicken Liver, Brown Rice, Barley, Guar Gum, Oatmeal, Potassium Chloride, Dicalcium Phosphate, Alfalfa Meal, Flaxseed, Olive Oil, Taurine, Choline Chloride, Salt, Carrageenan, Ferrous Sulfate, Zinc Sulfate, Niacin Supplement, Vitamin E Supplement, Vitamin B12 Supplement, Vitamin A Supplement, Vitamin D3 Supplement, Manganese Sulfate, Copper Sulfate, Sodium Selenite, Calcium Panthothenate, Riboflavin Supplement, Pyridoxine Hydrochloride, Biotin Supplement, Calcium Iodate. Available in 5.5 oz. “easy-open” cans. Con: Some cans had big air pockets where there was no food. Review: I used this as a supplemental food (i.e. flavoring dry food with a little wet). I even put a little on the dog’s food and they both really loved it. The cat goes crazy every time I open a new can. Con: No cons! Gourmet food that any cat would love! Review: If my cat could talk she would be saying ”Gimme s’more”! When I opened the can, she was flocking me like crazy! She really seemed to love this cat food! It is very high quality cat food with a lot of meat that any cat would love. My cat licked her bowl clean and stared at me for more. She got excited at every meal that I served it to her. Good stuff Solid Gold! 2 Features: No strong order. 2 Benefits: Kitty ate ever last bit of it. No. Stomach problems from it. Con: Expensive to feed only canned food so I mixed it with their dry food. Review: Both of my cats went crazy for this food and were very vocal when they saw me putting it in their dish. My friend Karen said her cat, Stinkers, really liked her gift sample also. My cats keep asking for me to give them more so I guess I’ll have to buy some to have on hand for them. Con: Would love to see it available at food co-ops in the Twin Cities. 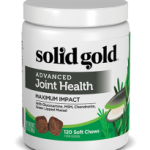 Review: This is an all-time favorite for my two large cats, one of whom has a highly sensitive digestive system. He loves the taste of this food and is able to process it well. I have recommended this food to other cat lovers. turkey/chicken and fish. But they really like it and is appealing to them, but can get to be very expensive when feeding foster cats. I mixed it with some warm water to give them more liquids and still they licked the bowls clean. I do not give them this every day. Review: I would buy the Solid Gold canned chicken/turkey/fish more often if the price was lower. The cats really enjoyed it and even the fussy ones liked it. Con: Too expensive to feed exclusively with multiple cats. Review: This food is great to have on-hand to give to fussy eaters which is common, especially when taking in a new foster cat. Although it’s too expensive to feed exclusively with multiple cats, it’s good for a treat or for cats who are not eating the other food provided for them. Review: My 19-year-old cat is a finicky eater as well as a light eater. Finding something that she will eat is a challenge. Fortunately, Bunny loved this canned cat food. I am so glad that we found this cat food. 2 Features: Healthy and according to Todd delicious. Con: The only problem is he likes so gold food so much he wakes me up in the middle of the night to eat. He actually succeeded in opening the cupboard and knocking a can out onto the counter. Review: I have tried other cat food. For one thing he won’t eat it for a long time. I was sick and Had a friend bring me some cat food. He finally ate it after three days And then his poop was so stinky And bulky I couldn’t believe it. Con: Our cat wouldn’t eat it … but Opie (the dog) LOVED it. 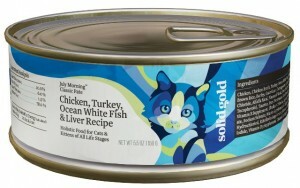 Review: Unfortunately, Princess would not eat the Chicken, Turkey, & White Fish Canned Cat Food. We think the primary reason is that she has always eaten a dry food diet. (She won’t eat ”people” food at all.) We tried mixing it with her dry food, and she left it (dry and wet) in her bowl for a full day, even though she usually eats something 3-4 times a day. What can we say, our cat is weird. HOWEVER, Opie (the dog) loved it. He would have eaten the whole can in one swallow, but given his sensitive senior tummy, we added a spoonful to his kibble as a treat once a day. Review: Our fussy kitty (is that redundant?) gets bored easily with food, so it’s a challenge to find something that she will eat for more than a day or two at a time. She ate this for 7 days straight without getting bored. We rotate proteins and formulas anyway, but this is definitely her new favorite! I don’t think she’s been on it long enough to see changes in coat or health, but am glad to be feeding her the healthy formula. Review: I supplement his kibbles with a can of Solid Gold every two days. Con: No cons that I can find. Review: This cat food was immediately accepted by all 3 cats from the 19 year old, the 7 year old, and the baby (7 months) old. I love that it contains some of the stuff that I supplement the cheap canned food with. I add flaxseed and olive oil or coconut oil and vitamins and minerals to say Friskies. I don’t add anything to this food which is way easier for me. At just a little more money it is so worth it. I will continue to buy this great food. P.S. The little extra treat for my friend was a nice Christmas present for her cats. I was kind of tempted to keep it for my own cats, but hey spread the love. Thank you all so much! Review: I think my foster cat Kayleigh liked this since when I first opened the can she started running back and forth through the kitchen, and meowing happily, just her reaction to the yummy smell alone was enough to convince me she would love this! Kayleigh has FIV and so it is very important to me and the rescue she is available for adoption through that she has the healthiest of foods – we felt very good about her eating this food based on ingredients and Solid Gold reputation. She says she will taste test and review for you anytime!! Review: Over the years I have been introducing new foods to my cat in the hopes of getting her to accept a healthier diet with lots of variety. It’s been slow going as I figure out what she will and won’t accept. The good news is that she’s getting used to changes and I was thrilled to see that she likes this food! I like to add a lot of water to a little bit of this food each morning and night so it’s quite soupy. She takes it all in! I have found this a useful way to ensure she’s getting enough water in her diet. Review: My cat couldn’t wait until the can was opened, and charged right in and ate it down. This cat will be 21 years old on January 5th. 2 Benefits: Cats loved it immediately and they are eating healthy ingredients. Con: It’s a bit pricey to feed daily, but I will buy if I ever see a deal on it! Review: Both of my cats have eating the same type of wet food throughout their lives. I finally found a second brand of wet food that they LOVE! 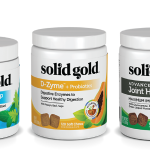 Usually, there are bits left in their dishes…not with Solid Gold’s food. Plus, it is so much healthier than their other preferred brand. Love. Thanks for a great cat food alternative!